Holly Willoughby’ secret to her glowing complexion is a special lotion made out of an exotic fruit. 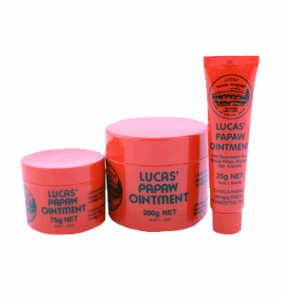 Holly Willoughby uses Lucas’ Papaw ointment ($7.5 for 25g), an Australian product which contains papaya and is great for cleansing and soothing. She posted a picture of herself without any make-up last week showing a perfect, dewy skin. Before taking the picture, Holly Willoughby will have removed her make-up with Liz Earle Cleanse & Polish Hot Cloth Cleanser. “I’ve used it for years and love it,” she says. “I tend to use a lot of Liz Earle products because they really suit my skin. Other favorites are Boots No 7 Quick Thinking 4-in-1 Make-Up Remover Wipes, Dermalogica Active Moist Moisturizer, and SK-II face masks. Holly Willoughby, 31, also reveals her love of beauty gadgets – she is a fan of the Clarisonic cleansing brush, which she uses in the shower once a week. But the key to looking so good “naked” is, according to her, having great eye-lashes and white teeth. She gets her lashes tinted, recommends Oral-B 3D White toothpaste and uses an electric toothbrush – hers is the Oral-B Trizone 5000 with SmartGuide. Indeed, she’s so obsessed with flossing her teeth that she even carries floss around with her in her handbag, so she’s never caught out. What Holly Willoughby neglects to mention is that having the confidence to leave the house without any make-up on also requires exceptional natural beauty. 4th of July: What you need for a perfect party?